This beautiful Parador is in the old town of Trujillo which is the birthplace of such conquistadors as Pizarro. 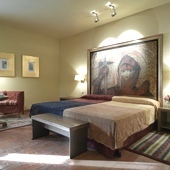 Situated in the former Santa Clara monastery, the Parador has an atmosphere of peace and quiet. Inside there are two beautiful cloisters; one Renaissance with arches and columns while the other is open and gives light which embellishes the surroundings. The Trujillo Parador is ideal for leisure or business with monastic style common rooms and spacious, quiet and pleasant living rooms. The bedrooms are dominated by wood and have modern amenities. The decor is based on a noble's bedroom in previous years. The dishes served in the dining room are a mixture of international and local dishes. There is also a special menu for those on a gluten free diet. In Trujillo visit the castle, the walls, the churches of San Martin and Santa Maria la Mayor and the Museum (and former house) of Pizarro. During Holy Week you may attend the festival of "The Descent of the Angel". Later in the year are the festival of Santa Ana from 24th to 30th of June which includes the traditional "La Revoltosa" ball which can be seen by visitors. Visit by car the near-by city of Caceres and also the Natural Park of Monfrague. The Jerte Valley has cherry trees blossoming in spring time. Also visit the Ibores region and the valley of La Vera. The Parador Trujillo has forty two twin bedded rooms, seven suites and one easy access room. All the rooms have a private bathroom and also a telephone, satellite television, safe, mini bar and air conditioning. The Parador of Trujillo has air conditioning in the living rooms, bedrooms and dining rooms, central heating, currency exchange, satellite television, garage and parking facilities (without security and limited places), free wireless internet, garden, seasonal swimming pool, restaurant (Gastrobar) and bar. Conference facilities are available if required. Distance from the nearest airport is approximately 150 kms and the nearest train station is 48 kms away. Amazingly nice stay for one night in Trujillo. So excellent, historic environment. Definitely want to come again and stay for more nights in Paradores. The Parador of Trujillo is excellent. Staff very friendly. Really enjoyed our stay. My wife and I had an absolutely marvellous time in both Paradores Trujillo and Zafra. The welcome and greeting at both receptions was first class. The rooms were excellent. 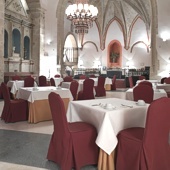 We ate at both Paradores – food fine. No noise – even at Zafra where the “Festa” was in full swing. At Zafra, we met the Director of the Parador – Sr. Antonio, who was very friendly and welcoming. I think that the courtyard dining at Zafra is probably one of the most beautiful settings in which I have ever eaten! We also stopped and had a light lunch at Tordesillas – really excellent – and the service again was brilliant. I am only sorry that I have not been able to travel throughout Spain in the past decade – but, hopefully, that will change in the future and I will again be able to visit the lovely Paradores in Spain. Many thanks. We loved all the Paradors we stayed in which was 4, Trujillo, Zaffra, Tordesillos and Lerma and it gave us the real feel of historic Spain and the real Spain in cultural and gastronomic terms. We would love to return and try more and go to some coastal ones next time. The staff were all very professional and friendly towards us which helped as we do not have a large understanding of the Spanish language. We would certainly recommend Paradors tp people who want to see the real Spain. 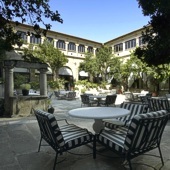 Parador de Trujillo is a hotel in a sixteenth century convent.